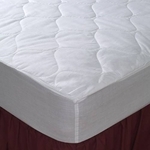 The Deluxe Poly/Cotton Fitted Mattress Pads are the hospitality industry standard in quilted mattress pads. 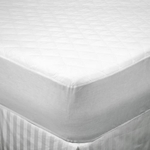 The Deluxe wholesale mattress pads have a poly/cotton top and bottom with a 12" woven poly/cotton skirt with a sewn in elastic band. 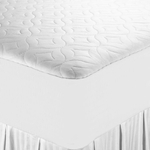 Constructed to last wash after wash.
Do you need quality wholesale mattress pads in a hurry? The Value Quick Ship Poly/Cotton Mattress Pads are available when you need wholesale mattress pads to ship quickly due to an approaching deadline.